We reviewed Caterpixer yesterday, a program to comfortably rename and copy files in the Windows operating system. It was an easy to use software program that lacked a few advanced features like file filters or regular expression support. Rename Master is an advanced tool to batch rename files that is offering these features and more. Rename Master's interface looks and feels slightly more complicated than that of Caterpixer. The main reason for that are the buttons and options that are presented to the user in the lower half of the interface. The upper part consists of a file browser that is displaying the directory structure of the computer system on the left side and the actual files of the active directory on the right. A file filter is available to display only files matching a certain pattern. This is also the location where the new file names can be previewed before starting the renaming. The lower part of the interface consists of four tabs that are used to configure the renaming. 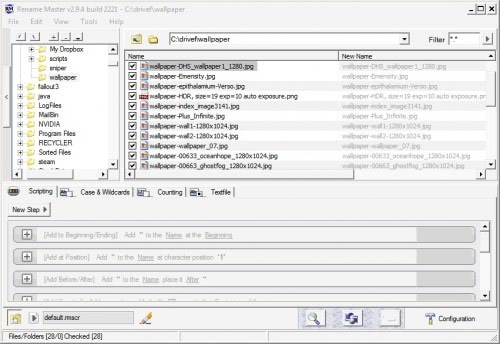 The scripting tab is the main tab in the renaming process. It contains ten options to rename the selected files which can be divided into options to add and remove characters. A click on the + sign in front of a filter will open the configuration menu of that filter. Any changes made to that filter will later be displayed in the overview as well. A click on the preview button will display the new file names in the upper part of the interface next to the old names. The three additional tabs in the lower area of the interface can be used to configure case and wildcards, counting and text files that are used to rename files. Windows users who want more control over the renaming process might want to take a look at Rename Master. The application takes more time to adjust to but rewards the user with better options to batch rename files in the operating system. I tried to download this software but it asked to enable ad to download. So I give up. I use Bulk Rename Utility. You should do a round up of these renamer apps. This site (JoeJoe’s freeware utilities)keeps on giving the “disabled when ads are blocked” sign, when i want to download v.2.9.3. But i do not block the ads. I even allow cookies. Any suggestion Martin. http://www.joejoesoft.com/cms/showpage.php?p=hot&f=userupload/8/files/rmv293.zip and there i have the same problem like before, JoeJoe’s freeware utilities keeps on giving the “disabled when ads are blocked” sign, when i want to download v.2.9.3. Any more suggestions Martin? I’ve been using many different batch rename programs over the years, but finally settled for Flash Renamer which I find to be to best in many ways. It has a very well thought out user interface and it has never let me down feature wise. It’s not free, but I guess you get what you pay for.